Titan has today released their alternative comic covers for issue one of their Tenth and Eleventh Doctor comic book series. More information and Eleventh Doctor comic cover below. This diptych variant cover by artist Brian Williamson (Torchwood, Gabba Gabba Hey! 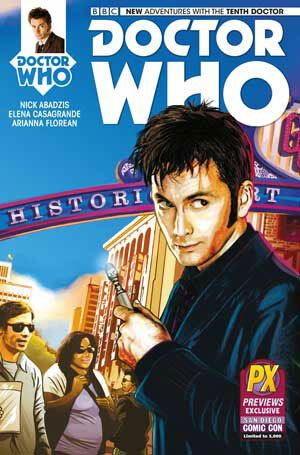 The Graphic Story of the Ramones) has been created especially for Diamond and features the Tenth Doctor and the Eleventh Doctor in front of the San Diego Gaslamp District. Day turns to night, and the SDCC crowds turn monstrous in this pair of interlinked variants! In this issue: The tenth Doctor is back, in an all-new ongoing series! Gabriella Gonzalez is stuck in a dead-end job in her family’s New York laundrette, dreaming of college and bigger, better, and brighter things. So when a strange man with an even stranger big blue box barges into her life on the eve of the Day of the Dead celebrations, talking about an infestation of psychic aliens, she seizes her chance for adventure with both hands. After Donna’s tragic exit, the Doctor thought he was done with companions. But Gabby Gonzalez is going to prove him wrong — if she survives the night! This SDCC 2014 edition is limited to 3,000 copies. 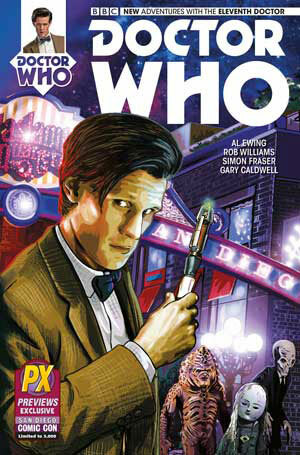 In this issue: The eleventh Doctor returns in an all-new ongoing series, with a time-twisting leap into the unknown! Geronimo! Alice Obiefune has just lost her mother when the Doctor explodes into her life. But what does a grieving young woman have to do with the career of a 70s musician, an amnesiac alien time traveler, and a terrifying cosmic threat? In the wake of the second Big Bang, discover what the Doctor gets up to when Amy and Rory aren’t around! Plus, every issue includes a “Titans” strip and a brand-new humor strip. This SDCC 2014 edition is limited to 3,000 copies. With thanks to Titan comics.